If you’ve been sleeping on Instagram, now’s the perfect time to capitalize on the platform’s current boom. Over a billion active users and counting. New features and functions for business being rolled out on a regular basis. However, the ever-changing Instagram algorithm is proving to be a challenge for brands looking to maximize their engagement. And while the change in reach isn’t as significant as Facebook’s recent updates, this is a prime opportunity to double-check that you’re following Instagram’s best practices. That’s why we put together this list of Instagram tips to ensure that your presence isn’t stuck in 2010. Whether you’re totally new to the platform or want to double-check that you’re running your Instagram by the book, all of these tips deserve your attention. Businesses often obsess over their photos and captions so much that they forget about one of the most important pieces of their Instagram profile. Your Instagram bio represents some seriously valuable real estate. From funneling visitors to your promotions to serving as a call to action, there’s a ton that brands can do in just a few words. Check out how Hello Fresh manages to tick off all of these boxes with their simple, clean bio. Among our most pressing Instagram tips for brands, this is a big one for your content strategy. Stories represent a clear priority for Instagram right now. They’re among the most popular types of content by far, acting as a sort of spiritual successor to Snapchat. Users can’t get enough of today’s time-sensitive, “self-destruct” style content. Meanwhile, new features such as Stories ads and audience polls further signal that the platform wants brands on board. If you’re looking for a boost in engagement, look no further than running regular Stories. The beauty of Stories is that there’s no expectation for them to be polished. Snapshots, selfies and bite-sized posts that show off your brand in the real world can be put together in no time. Although Stories might be king in terms of content, videos aren’t far behind. The need to produce video is universal among all social networks and Instagram is no exception. The good news? Doing so is easier than ever thanks to the slew of Instagram apps out there that serve as your pocket studio. Native apps such as Boomerang and Hyperlapse allow for straightforward video editing. In fact, even big brands like Krispy Kreme rely on bite-sized Boomerang videos as part of their feed. Instagram is all about compelling visual content. Videos are a prime way to instantly step up the entertainment value of your feed. If you’re looking for Instagram tips to raise your reach, start by looking at how you time your posts. In other words, how often you’re posting and at what time your content is going live. Do you stick to a schedule? Are you pretty much posting at random? But bear in mind that there are optimal times to post on social media. Although trends change and this doesn’t guarantee a flurry of new followers, anything you can do to set yourself up for more engagement is a plus. 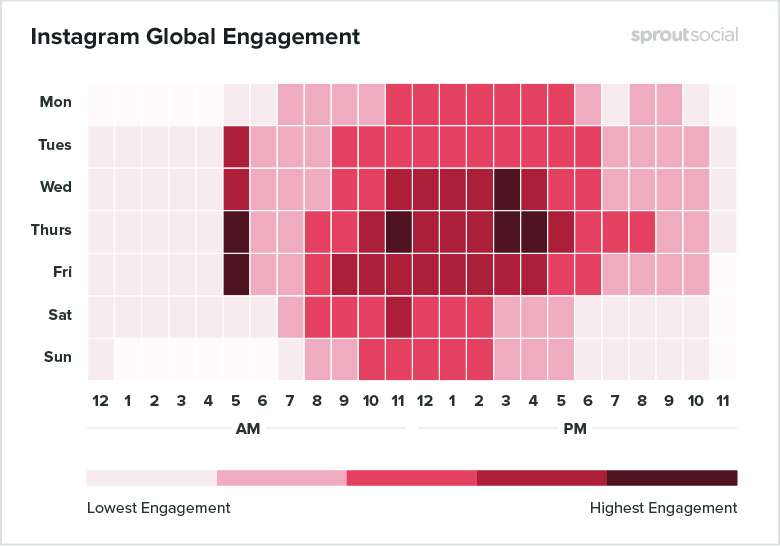 Here’s a quick overview of Sprout’s own findings in regard to post timing. 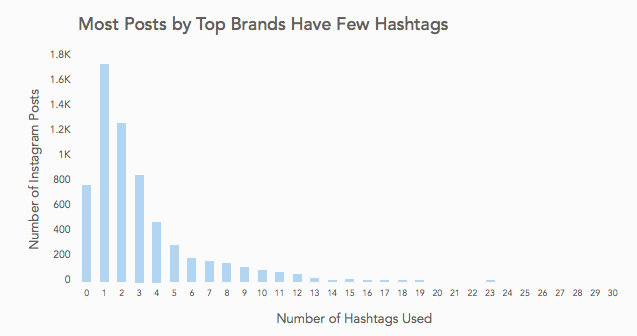 Consider that most brands are publishing to Instagram at least once a day. This allows brands plenty of time to map out what they want to publish and fine-tune their posts, too. Beyond Sprout’s own Instagram scheduling, features such as Viralpost can do the legwork for you of figuring out the best times for your brand to post based on audience behavior. Much like your bio, there’s much more to any given Instagram caption than meets the eye. Rather than post passively, captions serve as an opportunity to not only show off your creative side but also encourage engagement. Playful captions like this one from Terrapin do double-duty of encouraging action and putting the brand’s personality on display. In short, putting a bit of extra effort into your captions can help step up your engagement rate. Speaking of captions, many brands are scrambling for Instagram tips on how the heck to use hashtags. The two big functions of hashtags are making your posts searchable while also encouraging hashtag shares among your audience. Oftentimes you’ll see a combination of branded hashtags (#RedCup) and broader, community tags (#coffee), serving as a sort of best of both worlds. If you’re still stuck on how to use hashtags, perhaps the biggest Instagram tips we can offer is to not stuff them. Based on our own numbers, a “less is more” mentality seems to work best versus trying to cram dozens of tags into your captions. But consider that sometimes the best way to use hashtags is to, well, not use them at all. Again, creativity counts on Instagram. Don’t be afraid to post the occasional photo that speaks for itself. Bold statements like this one from Universal Studios are a great example of what we’re talking about. Feel overwhelmed with how much you’re expected to post on Instagram? That’s why it’s ideal to let your followers do some of the work for you. With the help of a branded hashtag, you can regularly encourage fans to post user-generated content that you can in turn regram yourself. This allows you to show your audience some love while also having a constant stream of content at your disposal. Here’s an example of curated content from Vans, sourced from their #MyVans hashtag. And here’s another from Anthropologie. Whether you’re strapped for ideas or just want to show some appreciation to your followers, regrams deserve a place within your content strategy. Do your customers and existing social followers actually know that you’re on Instagram? Seems like a no-brainer, but you might be surprised how many brands squander their off-platform promotion. For example, you can totally make occasional references to your Instagram on other networks such as Facebook and Twitter. As far as your website goes, social media buttons and embedding your feeds on your homepage are a good start. And if you have an email list, likewise include social buttons and regularly make reference to your Instagram presence. 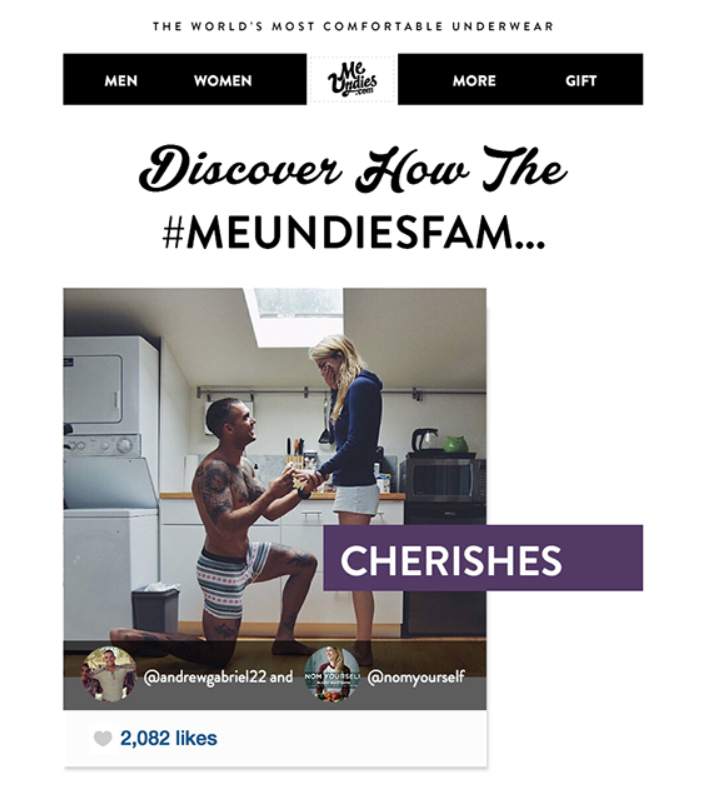 Check out how MeUndies published an entire email campaign centered around their Instagram and branded hashtag. Perhaps one of the biggest mistakes that brands make on Instagram is that they do all the talking. Replying to questions and tags from your followers is not only good customer service but also a positive signal for your engagement rate. Because how you go back-and-forth with actual people matters more than an arbitrary follower count. 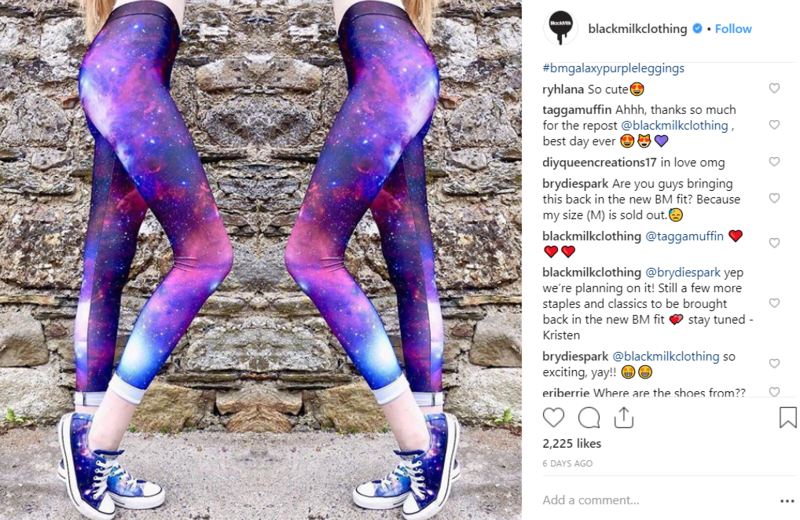 Check out how Black Milk Clothing thoughtfully responds to each and every fan and how they get some serious love in return. The need to respond to followers speaks to the importance of social listening and monitoring your mentions. This makes it easier to respond to questions and concerns in a timely manner. Beyond comments, anything you can do to show off the human side of your brand through your Instagram content is a major plus. There’s a reason why more and more businesses are focusing on storytelling and people-centric posts rather than just blasting products and promos. Not everything needs to be explicitly product-focused. In fact, the occasional off-the-cuff, personal photo is actually a smart move when in doubt. Obviously there is no shortage of options in terms of what you can post. Product and customer photos. Text overlays and memes. Selfies and snapshots in the wild. And that only scratches the surface. In order to organize what you’re posting and look at your Instagram presence in a more holistic way, a content calendar is a game-changer. 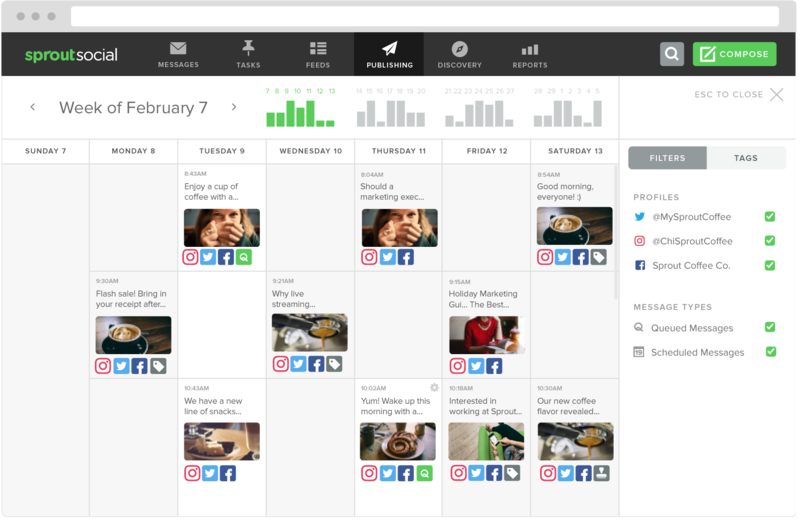 Sprout’s own Instagram integrations can help you keep a birds-eye view on your Instagram presence in addition to your social media strategy at large. Piggybacking on the last tip, brands need to know which types of content are their top-performers and where they need to improve in terms of their reach. Sprout can help with that, too. 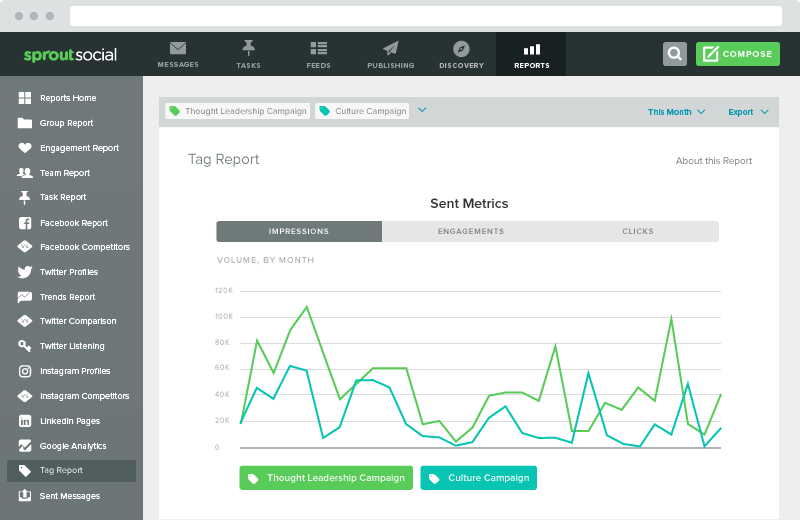 Analytics that cover everything from engagement rate to hashtags and beyond are part of Sprout’s suite. You can also tag posts as part of internal campaigns or other themes, allowing you to track how related sets of content are performing. Rather than fly blindly, having access to more robust analytics beyond Instagram’s native platform allow you to experiment with peace of mind. What Instagram tips do you think are the most important for today’s brands? If you’re looking to figure out the kinks in your Instagram presence, you certainly aren’t alone. More competition and Instagram’s updated algorithm signal the need for brands to make some serious changes. This combination of Instagram tips is key to optimizing your presence no matter what your industry might be. And with the help of Sprout, you can streamline those tweaks quickly and efficiently. We still want to hear from you, though. What Instagram tips do you have for fellow brands? Anything you’re still struggling with? Let us know in the comments below!